Two very different archival findings came together in dialogue. The first is an interwar family photo found at the flee market, which caught my eye because of a little girl’s glowing expression of joy. She is sitting, together with a sister (most probably) and older family members in the barn, close to a cute choir of bunnies. Whether her smile comes from this playful vicinity or from her awareness of the fact that she is being photographed is not important. Her illuminating joy contrasts with the other characters’ pose. 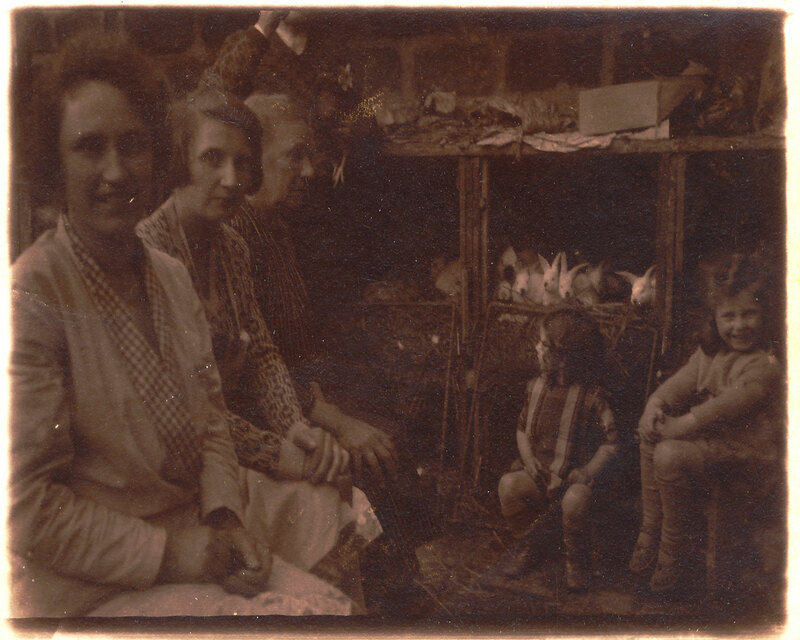 The other little girl seems to be half-absent, probably absorbed by another event not caught by the camera (there seems to be a secondary source of action in the upper part of the photograph, where we can vaguely notice a person holding a hen in her arms). As for the women in the foreground, only the younger one seems to echo the little girl’s large smile, and as our gaze moves towards the older ones, the joy comes across as inversely proportional to age. Not that that would say something about human beings that we didn’t already know, but this scaled choreography of the smile remains remarkable. The oldest woman in the picture doesn’t even look at the camera, not allowing herself to see the barn as a ceremonial and joyous place. The facial expressions seem to reflect the ambiguity of the barn: the burden of daily chores and of the unavoidable fate of the animals can hardly be forgotten under the appeasing air of domestic warmth that a smiling (and photographable) family reunion – with farm animals represented as pets – can bring along. 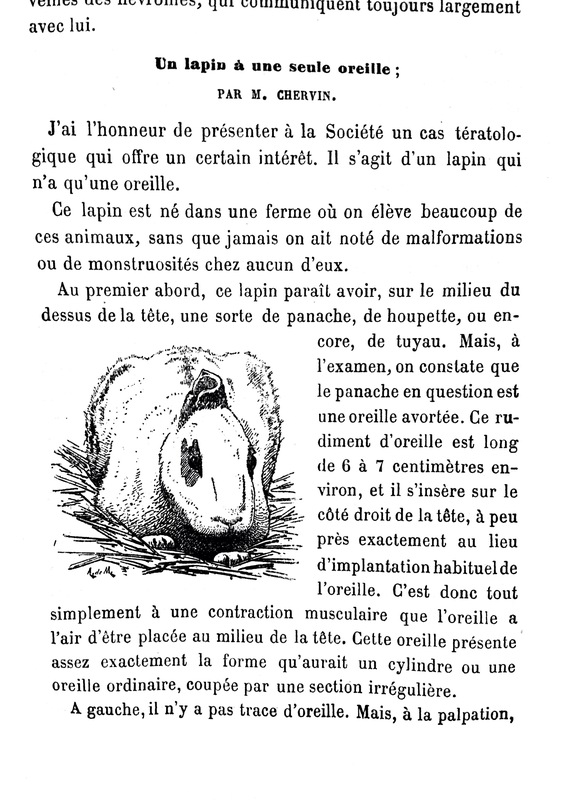 That was the point I was at in reading the photograph when I found this article in the Bulletin de la société d’anthropologie de Paris (October – December 1889), in which a certain M. Chervin reports the existence of a curious bunny with only one ear. A zealous servant of science, Chervin would have liked to recur to that foremost procedure meant to solve natural mysteries: autopsy. In describing the reasons of him not having been able to give a more accurate description of the phenomenon, he allows scientific discourse to be interrupted by a joyful anecdote – in which I could not help but picture the little girl in the previous photo, in a dozen exemplars. For what stopped Dr. Chervin from killing the one-eared rabbit was the fact the unfortunate animal “was the joy of the numerous children” of his informer. Science had then to wait until the animal’s natural death, upon which the promise had been made to subject the corpse to medical inquiries.